In this keynote address Johnson takes up current debates about the problems that queer theory proposes for conducting LGBT history. Drawing on the oral history research of Southern African American queer women, the he argues that performance as method provides an alternative to traditional historiography that is more in keeping with the open-endedness of queer theory, while also highlighting the erotics of narration embedded within oral history research. The lecture also engages the politics of a male researcher conducting research on queer women and whether or not the research constitutes feminist historiography. BIO: Johnson is the chair of African American Studies, Carlos Montezuma Professor of Performance Studies and African American Studies at Northwestern University. A scholar/artist, Johnson performs nationally and internationally and has published widely in the areas of race, gender, sexuality and performance. Johnson is the award-winning author of Appropriating Blackness: Performance and the Politics of Authenticity (Duke University Press, 2003), Sweet Tea: Black Gay Men of the South—An Oral History (University of North Carolina Press, 2008), and, most recently, Black. Queer. Southern. Women.—An Oral History (University of North Carolina Press, 2018). The conference and keynote are free and open to the public. Breakfast, lunch and heavy appetizers will be provided. 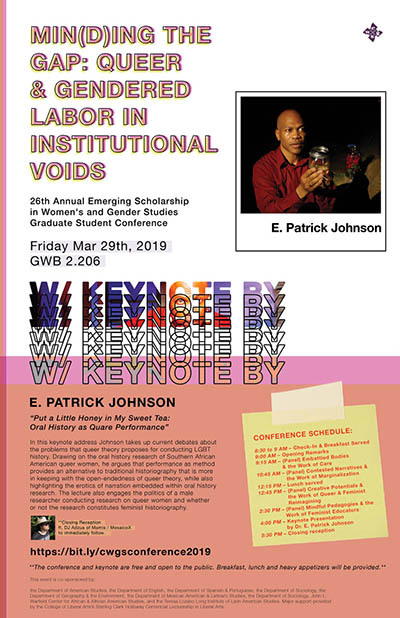 Keynote Presentation by Dr. E. Patrick Johnson 5:30 PM – Closing reception featuring DJ set by Adzua of Mamis / MosaicoX. This event is co-sponsored by: the Department of American Studies, the Department of English, the Department of Spanish & Portuguese, the Department of Sociology, the Department of Geography & the Environment, the Department of Mexican American & Latina/o Studies, the Department of Sociology, and the Teresa Lozano Long Institute of Latin American Studies. Major support provided by the College of Liberal Arts’s Sterling Clark Holloway Centennial Lectureship in Liberal Arts.